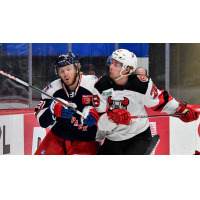 HARTFORD - The Binghamton Devils collected a point in a 4-3 overtime loss to the Hartford Wolf Pack at XL Center on Wednesday night. Hartford's John Gilmour kicked off the scoring in this one, beating Cam Johnson with a wrist shot from the right circle. Johnson made the initial save on Steven Fogarty from the opposite wing, but the rebound kicked out to Gilmour standing all alone in the circle. The Devils trailed 1-0 after 20 minutes of play and were out shot, 13-5. Binghamton came out of the first intermission buzzing, tying the game just 1:03 into second period. Alex Krushelnyski gathered a loose puck at the side of the net and beat Hartford goalie Brandon Halverson from a sharp angle for his first goal of the season. Sam Kurker and Nick Sorkin each recorded assists on the play. On the power play, Binghamton took a 2-1 lead courtesy of Nick Saracino. After the original chance was stopped by Halverson, Saracino kept digging and pushed the puck over the line for a one-lead at 7:44 of the second. Assists on Saracino's fourth of the year were credited to Ryan Schmelzer and John Ramage. Less than six minutes later, Tim Gettinger deflected the puck by Johnson on the power play to tie the game at two. Fogarty and Ryan Gropp picked up the assists on Gettinger's 13th of the season at 13:14 of the second period. With five seconds remaining in the middle frame, Egor Sharangovich was hauled down on a breakaway opportunity and given a penalty shot. Sharangovich skated in slowly on Halverson and pulled a nifty forehand-to-backhand move to put the puck past the sprawling goaltender. Sharangovich's ninth goal of the season gave the Devils a 3-2 lead heading into the final period of play. Hartford evened the score 3-3 in the third period while on a four-on-three power play. Off the faceoff, Gilmour set up Lettieri for a one timer. Lettieri caught all of the puck and hammered it past Johnson with 8:43 remaining in regualtion. The Wolf Pack aimed to take a lead on a late power play, but Johnson and the defense held the fort. After 60 minutes of play, the two teams headed for overtime. In overtime, Gilmour stole the puck from the Devils at the offensive blue line and beat Cam Johnson through the five-hole on the breakaway.